Freshly announced on SEGA’s social media whatnots is a new game for Nintendo Wii and DS entitled Sonic Colours/Colors which involves Dr. Eggman creating a theme park and after apparently ensalving some aliens called Wisps. A short teaser trailer for it is below and you immediately download the UK, Australian, French, Spanish, Italian and German versions from the brand new Sonic Colours video page in the Depository. Complete with Sonic Colours background – we’re so on the ball! 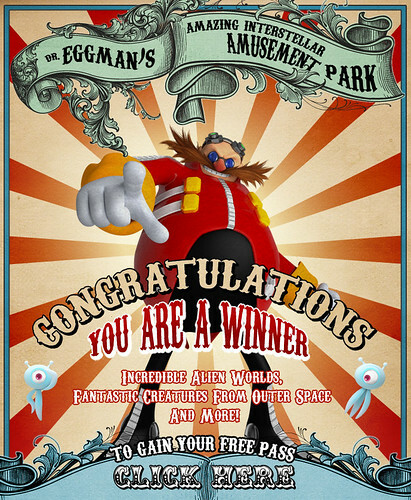 This came after users were sent a special congratulatory email from Dr. Eggman himself! An adrenaline-pumping super fast ride through an amazing interstellar amusement park! LONDON & SAN FRANCISCO (May 26th, 2010) – SEGA® Europe Ltd. & SEGA® America, Inc., today announced Sonic Colours™, a brand new high speed action adventure in which Sonic the Hedgehog races through incredible theme park inspired worlds to rescue a colourful alien race from the clutches of Dr Eggman. Sonic Colours will be available on the home video game system Wii™ and the Nintendo DS™ system late in 2010. We’ll have more updates VERY soon!